To keep your onion crop for months isn’t very difficult but does require attention to detail. There’s nothing worse than seeing your lovely crop going soft and disappearing under cottony white mould. Once your onions have swollen and growth has finished cut out any watering unless it’s blazing hot. Even then, just the minimum to maintain is all that’s wanted. Keep weeded though. The leaves will naturally flop over – do not bend them as some advise because you will damage the neck and they won’t store well. Once they start reaching this stage, go down the rows with a fork and gently lift each onion a little to break the roots from the ground. Stop watering completely. Leave the onions as they are for a week or two or until the weather breaks. Lift carefully, using a fork under the onions if the roots are still holding them. Do not wrench them out by the leaves or you will damage the neck. 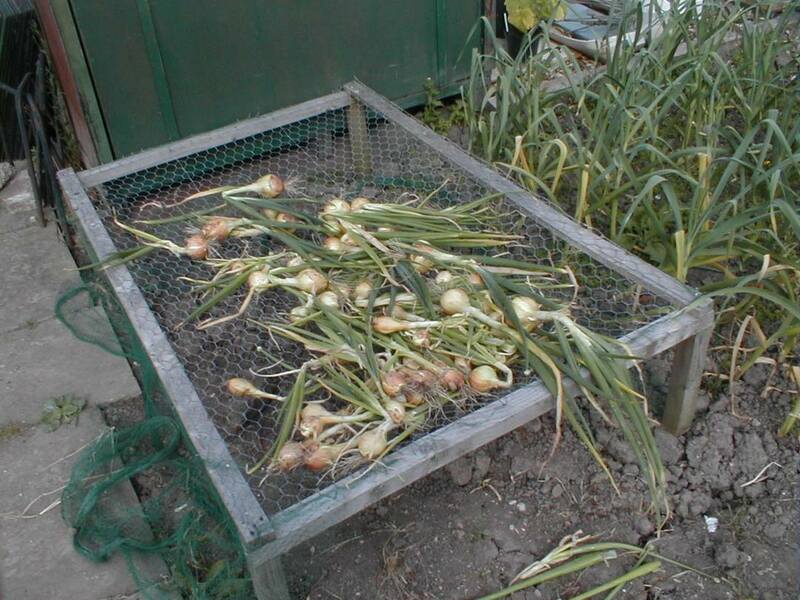 Place the onions on a drying frame or similar. I constructed mine from scrap wood and spare chicken wire. This allows the air to circulate and dry the onions out. If the weather is bad, arrange some sort of shelter above them to keep them from being soaked. To store well your onions need to be well dried out. The larger onions are more difficult for this. Resist the urge to dry them out somewhere too warm though. 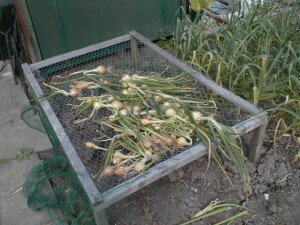 I used a greenhouse one year and one sunny day filled the air with the aroma of cooking onions. An expensive lesson as we lost the crop. Once dried, you then trim the roots to about half an inch (1cm) from the base and the leaves to about nine inches (22cm). Remove loose material. Next comes stringing. It’s complicated to explain, but once you have done it a couple of times you will find it simple and quick to do. Take a length of string and double it. Next make a loop at the base and feed the first onion into that. Hang the string from a nail to continue; it’s a lot easier. The next onion leaves are threaded through the double rope and then those from the one after are threaded in the opposite direction, alternating until your string is full. Through, around and down is what we repeat to keep the technique in mind. We cover this in more detail along with a diagram in our book How to Store Your Home Grown Produce. Hang the strings of onions in a cool but frost free dark place with good airflow. 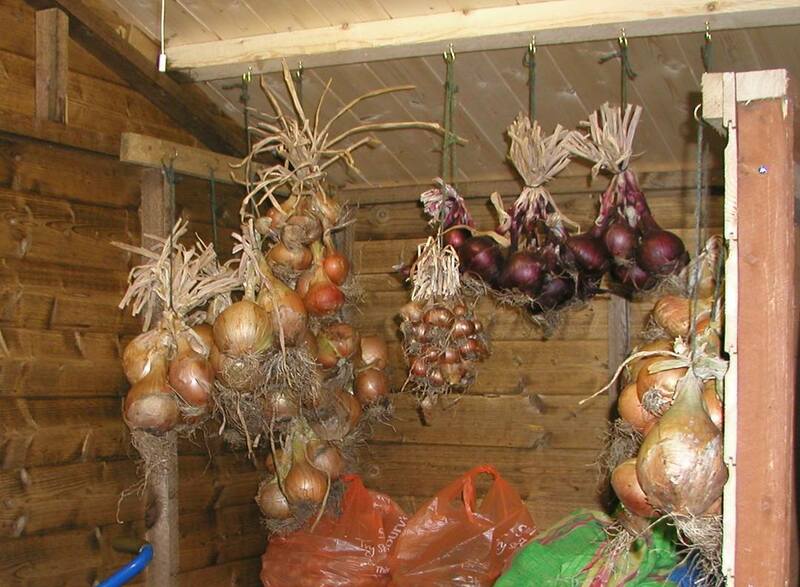 Check monthly and use or dispose of any onions showing signs of mould or softness. Damaged onions, particularly around the neck, will not store for long but they can be dried in a dehydrator or very low oven. Peel and cut them into ¼ inch (5 mm) slices. Separate the slices into rings – the very small centres are difficult to dry satisfactorily so it’s best to use them up for cooking fresh. Once cooled, pack into bottles or jars with airtight lids. Store in a dry, dark place. When required, soak them in warm water for about 30 minutes. If they are to be fried or grilled, pat them dry with kitchen roll paper before use. Onions can, of course, be pickled – see pickled onions recipe. Both of these store well and although the ‘correct’ method is to braid them like onions, it’s a very fiddly job. The easy way is just to let them dry off and then store in net bags hung from the wall in a dark place with good ventilation. The legs of old ladies’ tights and stockings make great storage nets. Don’t put too many in one net or the lack of airflow will encourage rot.